The novel and movie series of Harry Potter are big business. They helped make YA literature what it is today. Many fans have fallen in love with the characters and the world which they show through many creative ways including music. 1. Wizard Rock. The whole scene and bands. I am just lumping them all together in one or this would just be me listing some of them. I wanted to show off some other acts that are Potter fans too. 2. Insane Ian noted that River Cuomo of Weezer looks like a grown-up Potter, taking this idea we wrote a parody album of Harry Potter set to Weezer songs. He calls it Weezard. 3. Adam Warrock and Mikal kHill of the Thought Criminals have worked together a few times on mixtapes. One of them The Slytherin House Mixtape. Sampling the orchestral scores from the movies, they created a mixtape focused on the franchise, from the point of view of the more cunning and ambitious students. 4. The great Luke Ski has Christmas in Hogwarts, a parody of Run DMC’s “Christmas In Hollis” about Harry Potter at Christmastime. 5. Team StarKid a musical theatre production troupe, originally from Ann Arbor, MI and currently based in Chicago, who created their A Very Potter Musical and A Very Potter Sequel. Darren Criss of Glee fame plays Harry and wrote the majority of the music. 6. The nerd rock band Nuclear Bubble Wrap has done a number of Harry Potter songs over the years: Act Pottery, Avada Kedavra, and Draining the Lizard on a Dead Gay Wizard. 7. Not Literally is a trio of girls who love to make videos. They have done a whole slew of Potter music videos. 8. Scych has done an electric progressive rock song inspired by the Elder Wand in the HP series called the Eldruhn Wand. 9. Hello, The Future also has a Christmas song about Harry Potter; Merry Christmas, Harry Potter. What is it about Harry Potter, Christmas, and comedy musicians? 10. If you were wanting more nerdcore, here is The Wrock Snob’s top ten list of nerdcore songs with Potter references. Includes Kabuto the Python, Dr. Awkward, YTCracker, and more. Honorable Mention goes to an 8bit version of the Harry Potter theme also know as Hedwig’s Theme from the movie series. Adam Warrock has rapped about many topics in the past, lots of comic book stuff, webcomics, Firefly, individuality, unity, not watching Doctor Who, and more. 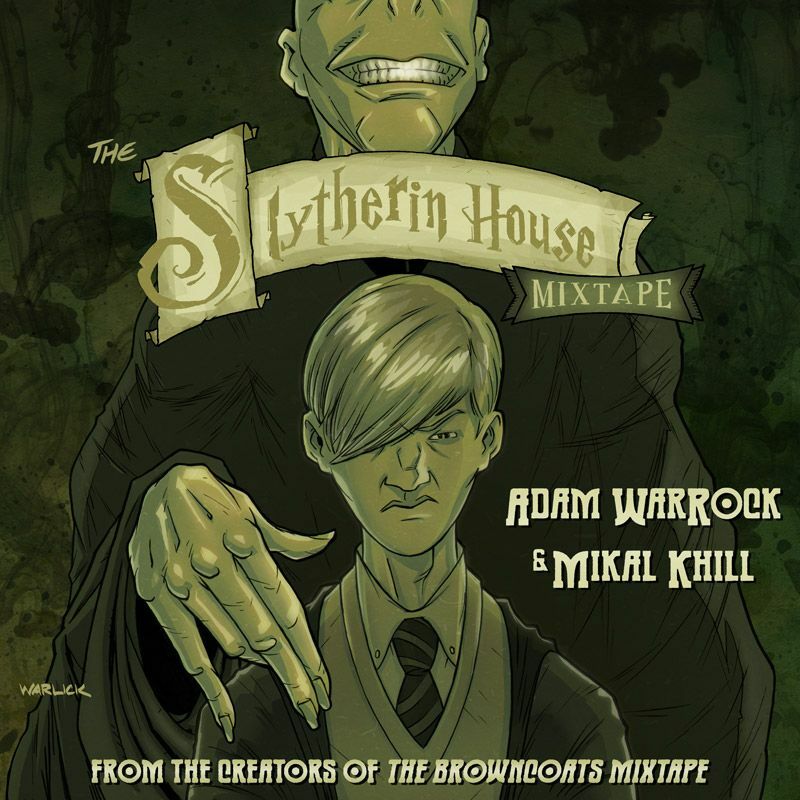 His latest project, produced by Mikal kHill of Thought Criminals, tackles Harry Potter in the Slytherin House Mixtape. The album uses remixes from the Harry Potter movie soundtracks with original lyrics. The album was delayed a few times, with hard drive crashes, laptop stolen, and being busy with other projects. Worth the wait though. The album features Tribe One, Sulfur of the Thought Criminals, Ceschi Ramos, and Dr. Awkward. The songs cover various topics of the Potterverse from a Slytherin perspective. Going over topics related to the house (Parseltongue, Ambition), members of it (Malfoys, House of Black), or just stuff about the dark arts in general (Dark Mark, The Hallows). Now personally I am not a big Potter fan. Just never really got into it. I have seen a few movies and my family who have read all the books and seen all the movies have told me stuff. There are a few things in the songs I am able to pick up on, but true fans will have an easier time getting all the meanings. The album has eleven tracks, the first one is audio from the Goblet of Fire when Voldermort is finally resurrected. The other ten are all music. My personal favorite track is Parseltongue, also the longest track. Becoming evil to become powerful through dark underground classes. Talks about how outcasts and the beaten can seek revenge. Well that is my interpretation of it. Wands Out, next favorite, continues on with this theme. More about the unity of the house and how they deal with those that mess with one of their members. The beats of the album are melodious. Flowing along easily with a good tempo. Lyrics play along with the beats. Talks about the dark side, how people come to it and what they do with it. You can get the whole thing for free at the Slytherin Mixtape website. Something for any Potter fan or fan of good hip-hop in general. One of the oldest and most popular sci-fi series is Doctor Who. It has spawned tv series, books, comics, audio dramas, toys, games, fan works, arguments, and much more . It has also inspired people to create music inspired/based on the Doctor, his adventures, companions, monsters, and everything else. Here are a couple of things for fans to check out. 1. Credit goes to Alex Day for the idea of Time Lord Rock (trock) just a few years ago. He formed the band Chameleon Circuit with Charlie McDonnell, Liam Dryden, and Chris Beattie. They promoted themselves through YouTube, MySpace, and with Don’t Forget to be Awesome (DFTBA). They have released two albums so far. 2. It Takes Who by uber geek Great Luke Ski with Carrie Dahlby as ac-companion-y chorus. It covers the 2005-2006 seasons of new Doctor Who as a parody of It Takes Two by Rob Base and DJ EZ Rock. 4. Ken Spivey is a songwriter and performer who specializes in Doctor Who and Celtic music. Combines a them both and more in his work. Also founded his own Doctor Who cons. 5. [Doctor Who’s On] Tonight, Tonight by Paul and Trina aka the 8th Horcrux, a parody of “Tonight, Tonight” by Hot Chelle Rae written after the end of Season 6. This Wizard Rock band tackles another British product very well. 6. Tom Milsom, London-based musician created his own free trock album. Very relaxing melodies and haunting lyrics. 7. I Am the Doctor by Devo Spice mostly focusses on Matt Smith’s run, but Eccleston and Tennant get a few references too. I am just hoping he is able to sign it for Peter Davison at Mysticon this weekend, maybe even get him to sign along. Background singing by Chris Mezzolesta of Power Salad and Shoebox of Worm Quartet. The part of British Woman was played by Kim Crist. 8. Time Crash claims to be America’s first trock band, but really they might just be the first one to actually put any effort into making a go at it instead of just doing a song or two. 9.Consortium 499 has created two Doctor Who tribute videos with his original score to them Dire Repercussions and Three Moons on Thursday. He too will have a chance to share it with Davison at Mysticon. 10. Trock On! is an album of 18 songs by 18 different trock bands. Shows you the best of the genre. Chameleon Circuit and Tom Milson both appear on this album as well. Honorable Mention goes to Adam Warrock for his song “I Have Never Watched Doctor Who.” Based on his true experiences having never watched the show. Great for your friends who have never watched seen the show. Though why you would call them friends? Also fun for those who do know Who and can spot what is wrong with his descriptions. Strangely one of his most requested songs. With Christmas coming up I thought I share some new songs to sing this season to share your love of fandom. 1. It’s a Fanboy Christmas Part 1, Part 2, and Part 3 Luke Ski is a series of Christmas melodies reworked to be about various sci-fi, fantasy, and the like media. Keep an eye on Luke’s website to see if he puts them up for free or if he releases another one this year. 2. Steampunk band The Men That Will Not be Blamed for Nothing have a Christmas album to check out. A Very Steampunk Christmas is a four track release that comes as 7″ vinly or digital download. Album includes a different take on a Christmas Carol and punk versions of God Rest Ye Merry Gentlemen and Silent Night. 3. Star Wars Christmas by Sci-Fried and Kirby Krackle’s version Rudoph the Red Nose Reindeer both give you some rocking tunes for Christmas. 4. The 8bits of Christmas is a holiday release from 8bitpeoples with 8 chiptune artists using 8 different consoles and computers to produce 8bit versions of classic Christmas songs. Get it and other albums for free on the 8bitpeoples website and have a chippy Christmas. 5. For some video game related songs we have Gekkos have Christmas in Hyrule telling about Christmas in the Zelda games, Isane Ian with WOW, Christmas! sharing how he spends Christmas and feeds his Warcraft addiction, and Pallete Swap Ninja singing about lack of Wii units in Wii Christmastime. 6. For a selection of Christmas wrock music I have found this nice little playlist. A collection of songs that even He Who Must Not Be Named would find jolly. 7. I also have playlist for Vocaloid covers of Christmas songs and a few originals. So enjoy some robotic cheer. 8. There is also Homestuck for the Holidays, I have not even bothered to listen to any of it. Cause it is Homestuck and I have no plans to find out what those kids at cons are talking about, so enjoy if you care. 9. Nerdcore rapper Random/Mega Ran has put out a holiday album this year. A Very Random Christmas is a banging Christmas album that is not all that geeky but is clean and fun plus it is free too, so yeah on free. Need to check out him reading ‘Twas The Night Before Christmas giving it a more urban slant. 10. and of course Another Creepy Christmas by Jonah Knight is on the list. I have talked more about that one previously. Honorable Mention goes to Bow Down to the Power of Santa from the Invader Zim Christmas Special. It has become a traditional Christmas song at my house hold ever since it first premiered. Try playing some of these songs at your next holiday gathering. This weekended is Wrockfest in Greensboro, NC. The event is being called “WrockFesTEA at Madame Puddifoot’s,” bringing together wizard rock and tea for a weekend of something or other. It will take place at The Secret Tea Room Cafe where the venue will has a special Hogwarts style menu of butterbeer and old English favorites planned. Things get started at 3pm on Saturday and go till 9pm. On Sunday it is from 1pm till 6pm. The band line up has a variety of wizard rockers and others: Alex “The Lone Gunman” Boyd, Bella and le Strangers, Blibbering Humdingers, Danny Birt, George’s Left Ear, Hawthorn & Holly, Kwikspell, Lauren Fairweather, Miss Parkinson, Muggle Mike, Penelope Clearwater Experience, Snidget, Witherwings, and The Whomping Willows. There will be songs about wizards, muggles, time lords, comic book heroes, starship captains, mad hatters, vampire slayers, tentacled monsters, pokemon, and all kinds of nerdy goodness. A pre-party on Friday night in Charlotte, NC is being planned. Starts at 6pm at the home of Hawthorn & Holly. Kwikspell, Alex Boy, and more will be performing. Tickets for the event are $25 for both days and $15 for just a single day. All money taken at the door. A local Holiday Inn Express has a special wizard group rate and will be the location for any after parties.